The city is famous for its colorful festivals, distinct food, and breathtaking scenery. 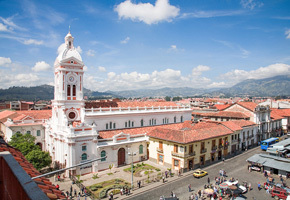 Because of its history and state of preservation, Cuenca is one of Ecuador’s three UNESCO World Heritage Trust sites (the others are Quito and the Galapagos Islands). 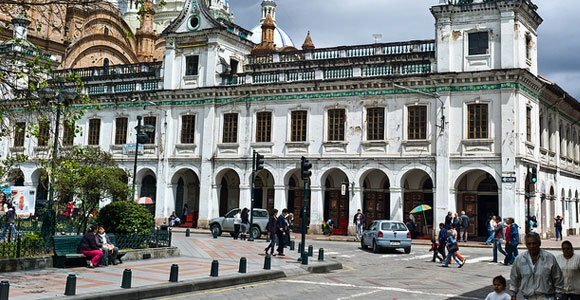 Founded in 1557, Cuenca was not connected to the rest of Ecuador with a paved road until the early 1960s, a fact that helped preserve both its architecture and heritage. Since then, Cuenca has developed rapidly and today has a strong infrastructure and efficient transportation system. Cuenca means “basin” in Spanish, and the city sits on a plateau surrounded by mountains. Four rivers are found in the Cuenca basin and one, the Tomebamba, runs right through the center of town. 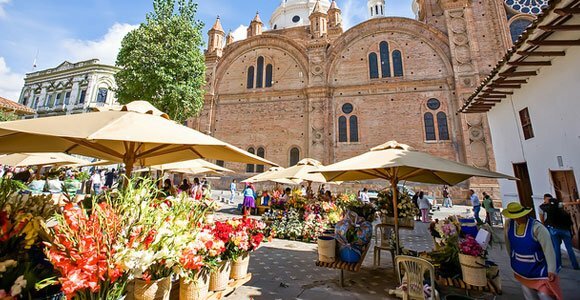 Although near the equator, Cuenca sits high in the southern Andes at an altitude of 8,300 feet and its residents enjoy year round spring-like weather. Temperatures rarely go beyond highs in the 70s F and lows in the 50s F, so a sweater or light jacket is sufficient all year long. Rainfall averages around three inches per month. Cuenca’s two “seasons” are rainy and dry. The rainy season, roughly from January through May, features warm sunny mornings and frequent afternoon showers. During the middle of the dry season (June through December), expect long periods of chilly weather and overcast skies. 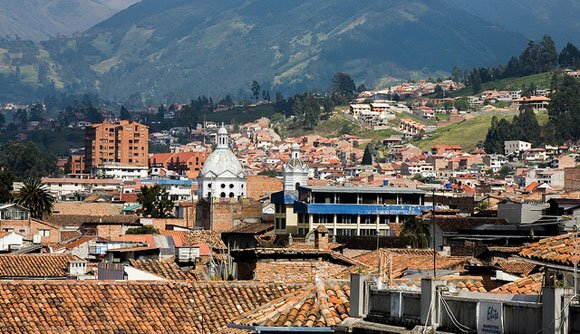 Cuenca has been the fastest growing city in Ecuador since 2000, and now boasts a population of 580,000. Over 75% of residents live outside the historic center in what is called New Town. New Town features a mixture of the city’s first suburbs, plus many modern mid-rise condominiums. It also has four malls, numerous hospitals, grocery stores, cinemas, plus scores of restaurants serving a wide variety of international cuisines. In spite of its size, Cuenca is a pedestrian-friendly city. Most expats forego vehicle ownership in favor of walking, taxis, and buses. The average taxi fare is $2.00 – $2.50, and bus fare is only 25 cents. Plans are also being considered to convert a large area of downtown streets to pedestrian-only. Major infrastructure improvements are a constant throughout Cuenca. You’ll find new play areas for kids and exercise equipment for all ages throughout the city. As cobblestone streets are repaired, construction crews take the opportunity to bury utility lines and upgrade the sewer system. Sidewalks are being widened, and if you like to cycle, you’re in luck, as new bike lanes are showing up all over town. This is also the artistic mecca of southern Ecuador. Artisans produce fine leather goods, custom made guitars, filigree jewelry, ceramics, and an array of other high quality products. And of course the famous Panama hats (which originated in this country, not Panama). Cuenca’s growing expat community is currently estimated to be around 5,000. As the number of foreign residents has expanded, so have goods and services catering to North American tastes. Expats run restaurants, offer hair, massage, and aesthetician services, do computer repairs, and sell real estate. If you’re looking for a rich cultural life with a mix of historic and modern, you will enjoy retirement in Cuenca. 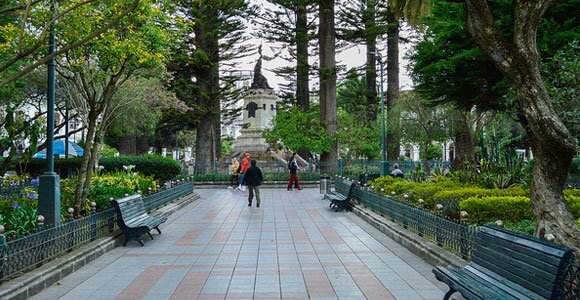 Cuenca is attracting more expats than any other location in Ecuador, living up to International Living’s designation as one of the best retirement destinations in the world. Cuenca’s temperate climate is a major draw. The excellent weather means local fresh fruits and vegetables are available year-round. Visit one of the city’s large mercados (markets) and take home bags of just-picked produce almost too heavy to carry for less than $10. Ecuador’s constitution forbids the practice of GMOs, so you know what you’re eating is the real thing. If you’re interested in an active retirement, Cuenca is the place to be. You can go hiking, trout fishing, and biking. Take a short trip to the coast for deep sea fishing, wind surfing, or even hang gliding. If your idea of retirement is a bit more tame, just walking around Cuenca’s lovely cobblestone streets is great exercise that invariably reveals new discoveries. Proximity to the U.S. and Canada is one of Cuenca’s appealing traits. A connecting flight to Ecuador’s international airports in Quito and Guayaquil is less than an hour and costs as little as $60. From either of these locations, non-stop flights to Miami take as little as four hours. Excellent healthcare is a major consideration for anyone considering an overseas move. Cuenca has several top notch hospitals, and many of the physicians have studied abroad and are bilingual. For the quality of care offered, costs are amazingly low. An office visit runs around $30, procedures and medications are a fraction of their prices in North America, and most drugs can be easily purchased over the counter. Many expats are taking advantage of the option to join Ecuador’s Social Security healthcare system. Open now to all residents, there are no age or pre-existing exclusions, and complete coverage costs only a little more than $70 a month for a couple. Cuenca has both a Social Security hospital in the suburbs and a clinic in the downtown historic district. Significant cost savings are offered to residents 65 and older. Public transportation and events are half price, as are utilities if you own your residence. Big discounts are available for international flights originating in Ecuador, as well as all flights within the country. Cuenca’s large expat population makes assimilation into your new surroundings a breeze. It’s easy to meet new friends, and two local online publications run by expats offer opportunities to buy and sell products and keep up with the many events going on around town. When living in Cuenca there is no excuse to ever be bored. Whatever lifestyle you desire, you’ll discover Cuenca has many affordable options. Cultural activities abound in Cuenca. Festivals complete with parades, artisan markets, and plenty of fireworks take place throughout the year. Attend film festivals, art exhibits, and live music events. Explore the city’s many museums. Catch a first-run movie (in English) at the multiplex. Cuenca even has its own symphony orchestra—and the performances are free! For the outdoors enthusiast, hiking in nearby Cajas National Park takes you into a pristine world of natural beauty. Try your luck trout fishing in one of the park’s over 200 lakes. Take a horseback ride through the impossibly green countryside (and don’t forget your camera!). Join one of the bicycle clubs that meet weekly for evening rides through the city. Eating out is a favorite expat pastime, and Cuenca’s dining scene is absolutely exploding with choices. In addition to local cuisine (which includes fixed menu lunches for as low as $2.50) you can choose from Italian, Chinese, Austrian, Swiss, sushi, pizza, and steaks, to name just a few. Several restaurants owned by expats offer everything from waffles and Eggs Benedict, to Cajun shrimp and barbecue. Feel the urge to get away for the day? Tour Ingapirca, Ecuador’s best preserved Inca ruins. Take a ride on the Devil’s Nose train. Visit a massive waterfall in a misty cloud forest, then an hour later find yourself standing in a cactus-filled desert. Or simply relax at a nearby resort with thermal pools, volcanic mud baths, and lots of pampering spa services. If you’re not in the mood to be so busy, have a coffee with friends at a sidewalk café, or enjoy a leisurely lunch that stretches far into the afternoon. You can always take that siesta a little later. After years of steady appreciation, the real estate market in Cuenca has stabilized. It all started when the recession of 2008 brought a steady stream of Ecuadorians home from working abroad, mainly in the U.S. and Spain. Their return created a housing boom throughout the country, especially in the urban centers of Guayaquil, Quito, and Cuenca. The stream has now become a trickle, and combined with recent tax increases on imported building materials, the housing industry has slowed significantly. Compared to prices in North America, real estate in Cuenca continues to be a bargain. Many newly-arrived expats use the purchase of real estate (a tax assessed value of only $25,000 is necessary to qualify) to obtain their residence visa. Thought the days of the $50,000 condo in Cuenca were over? We found a furnished studio overlooking the Tomebamba river that’s near shopping and the bus line. Stove, refrigerator, and water heater are also included. Price: $45,000. A fully furnished one-bedroom, one-bath condo with fantastic views in one of Cuenca’s best areas. Nice sized kitchen, big closets, and separate laundry area. Price: $68,000. A three-bedroom, two-and-a-half-bath townhome with 1,500 square feet close to public transportation and 15 minutes from the city. Modern kitchen, parking, and a small garden. Price: $75,500. A new three-bedroom, two-and-a-half bathroom townhome, plus an office with 1,592 square feet. The unit has a private patio and parking and is part of a small development with 24 hour gated security. Price: $117,500. A three-bedroom, two-and-a-half bathroom condo with 1,335 square feet overlooking the Yanuncay river. The unit has built-in closets, granite countertops in a spacious kitchen, and a large private terrace. Close to El Centro, supermarkets, and shopping. Price: $139,000. IL always recommends renting before you buy, and the best way to do both is to get “boots on the ground.” Decide what features you are looking for and walk around different neighborhoods looking for “Se Vende” (For Sale) and “Se Arrienda” (For Rent) signs. Ask the security guards in desirable buildings if anything is available. Be aware that the real estate market in Ecuador in no way resembles what you’re probably used to. There is no MLS and agents are very protective of their own listings. Many great opportunities are never listed at all, so network with everyone you meet—locals often know a friend or relative who owns available housing. The classified section of local newspapers are a good source of real estate information. If you aren’t fluent in Spanish, hire a bilingual facilitator to assist you. Real estate agents will be happy to show you their listings but generally don’t get involved in the rental market. Even though cost of living in Cuenca is low, First World amenities and comforts abound. From high-speed internet, smartphones, and HD televisions, to new cars, classy restaurants, and gorgeous penthouse apartments, Cuenca has almost everything you could think of. As is true everywhere, your lifestyle will determine your budget. A frugal single person can get by in Cuenca on less than $1,000 per month. Conversely, a couple who rents a high-end condo, eats out frequently (and enjoys good wine with meals), and owns a car, would probably have budget exceeding $2,500 a month. The location you choose can also make a difference, although one usual rule of thumb doesn’t apply. Often the convenience of downtown living comes at a premium. In Cuenca this is not always the case. Why? Because many dwellings in the central historic district have not been updated and modernized, making them more affordable. Utilities are amazingly affordable. The temperate climate negates the need for heating and air conditioning. Water (Cuenca’s tap water is drinkable) and natural gas each normally cost less than $10 per month. Internet service begins at around $35. Most expats purchase cheap cell phones and buy minutes as needed rather than committing to a service contract. Cuenca’s year round spring-like weather means local fresh fruits and vegetables are always available at low prices. On the other hand, expect to pay a premium for imported goods of all types. That includes shoes, clothing, wine, and electronics, as well as food items from the U.S. Here is a sample monthly budget for a couple in Cuenca. Included is the cost of a vehicle, although most expats find they don’t need one. Not included is travel, which can vary dramatically from household to household, depending on your lifestyle. There are many reasons Cuenca has been one of the hottest expat destinations on the planet for the past few years. This UNESCO World Heritage city of a half million residents boasts a temperate climate, low cost of living, top-notch medical care, and proximity to North America—not to mention lots of modern amenities like malls, cinemas, great restaurants and shopping. It is estimated that 4,000-5,000 expats now live in Cuenca, and that total is steadily increasing. If Cuenca is on your radar for a possible relocation you are probably curious to know just where all these foreigners reside. Do expats tend to cluster in gated communities? Are there preferred neighborhoods in the city? The answer to the first question is an emphatic “no.” Expats are happily living all over the place. That being said, there are several neighborhoods (barrios) where foreigners tend to congregate. El Centro, the city’s historic district is a highly desirable location with its colonial architecture, cobblestone streets, and lovely parks. Museums, restaurants, art galleries, and abundant shopping are all within easy walking distance. However, during the daytime hours Cuenca’s downtown streets are busy, noisy, and crowded. A new light rail system currently under construction will soon help mitigate this problem. The biggest challenge to living in El Centro is finding modern living quarters in a quiet area. But with persistence (and maybe a bit of luck) lots of expats have located charming homes and are enjoying a delightful in-town experience. Avenida Ordonez Lasso, west of the downtown area, is commonly nicknamed “Gringolandia” because it has by far the highest concentration of expats. Why? The avenue is lined with mid- to high-rise residential towers, so the density of buildings means there is always more inventory available. And, honestly, many expats enjoy being around others, especially when they are first getting settled. Cuenca has so many attractive neighborhoods ideal for expat living you’ll be sure to find one that suits your needs. While there is a high noise level from traffic and general busyness along the main thoroughfare, just south of Ordonez Lasso life quiets down. Modern condos are scattered among lovely old homes along the shady banks of the tree-lined Tomebamba River. Further out on the south bank of the Yununcay River is a neighborhood known as Primero de Mayo. This area is quite close to one of Cuenca’s two major malls, but the need for a car starts creeping in as shopping and restaurants are beyond reasonable walking distance. Several brand new condo buildings have just been completed and more are on the way. Expats who settle in Primero de Mayo love its quiet, private setting. The El Vergel/Stadium barrio is directly south of El Centro on the opposite side of the Tomebamba River. This was Cuenca’s first suburban area, and many grand old homes still stand on quiet streets with large yards and mature trees. Today it offers the best of close-in living. Abundant shopping and dining options abound (plus a five-screen multiplex), yet Parque Calderon, Cuenca’s central square in the middle of the downtown historic district, is less than a half-hour walk. With so many amenities it’s no surprise that available housing is always at a premium in this highly appealing neighborhood. In all of these areas housing options to rent or purchase run the gamut from small apartments to penthouse condos to single family homes. Venturing to the outskirts of Cuenca, apartments or condos can be crossed off the list of housing options as you’ll only find free-standing homes with sizeable lots. Also owning a vehicle becomes a necessity. San Joaquin, while only a 10-minute drive west of Cuenca, is a completely different world. Small farms create a mosaic of colors, and herds of cattle lazily graze in large fields. Expats looking for a rural environment with convenient access to town are drawn to San Joaquin. They praise the isolation and clean (but quite chilly) mountain air flowing down from the adjacent Cajas mountain range. Cuenca and its surrounding areas offer a remarkable diversity of housing and lifestyle choices. Decide what type of environment and lifestyle you desire, then get out there and find your perfect home!